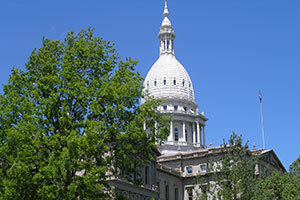 Senator Jim Stamas, R-Midland, discusses the ‘Good Jobs for Michigan’ package on WBKB. 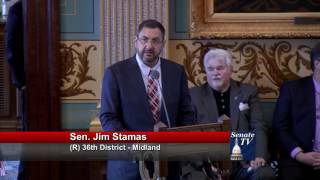 Senator Jim Stamas, R-Midland, honored Chemical Bank on their 100th anniversary of opening for business, at the Michigan Senate, during the March 14, 2017 session. 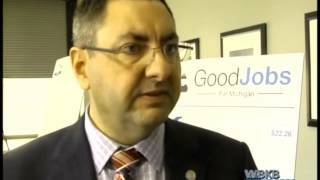 Senator Jim Stamas, R-Midland, talks about encouraging children to read during March is Reading Month. 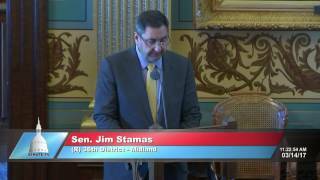 Senator Jim Stamas, R-Midland, speaks on the floor of the Michigan Senate in support of the Peter A. Pettalia Memorial Act amendment during the Nov. 29, 2016 session. 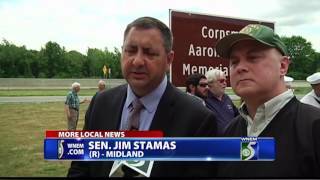 Senator Jim Stamas, R-Midland, participates in the dedication of the Corpsman Aaron D. Ullom Memorial Bridge.